Who Are Involved In Biosafety? Consider persons involved in an aquaculture proposal for a seacoast: ecologists, statisticians, geographers, lawyers, meteorologists, oceanographers, geologists, chemists, pharmacologists, zoologists, botanists, microbiologists, molecular biologists, computer scientists, engineers, governmental regulators, entrepreneurs, support personnel of varying disciplines and levels of expertise, etc. Consider the persons and disciplines involved in developing and assesolved in developing and assessing risk for such processes: the molecular biologist models the insertion of the new gene, the biologist finds an organism containing the gene, the chemist predicts the structure and function of the product, the immunologist finds epitopes for antibody adsorption to purify the product, the microbiologist projects the new growth rate, morphology, and biochemistry of the host strain, the regulator predicts hazard, and the ecologist predicts long term interactions. Each of these disciplines have their own vocabulary and conventions of communication. Even within a discipline such as microbiology, communication problems exist. The most common way of describing an organism is through the species name. Thus, we "identify" an organism as belonging to a particular species. However, different methods such as pure culture phenotypic assessment methods can give very different identifications from immunologic or genetic probes. This problem becomes critical if we wish to follow to follow changes in the microbial populations of two sites by different methods. The limiting factor in interdisciplinary communication is the ability of the persons involved to understand the vocabulary and nomenclature of all the disciplines included to the level needed to reason with the information. The user of information must receive input from disparate disciplines each of which have their own jargon. The practitioners of the various disciplines invent new words and give new meaning to old words as their disciplines advance. This inevitable practice facilitates communication locally but creates noise globally. Therefore, any information resource to aid persons concerned with biosafety must be sensitive to the issue of multidisciplinary information and interdisciplinary communication in the broadest sense. The design characteristics of a resource was developed by the international participanal participants in a workshop sponsored by UNEP and organized by the Microbial Strain Data Network (MSDN) in 1991 (Kirsop, B. and Krichevsky M. I. (1991) Needs and specifications for an international resource on the release of organisms in the environment. Proceedings of a Simultaneous Workshop held in Rockville, MD, USA and Vienna, Austria, March 1991. (UNEP, Nairobi, 1991). The basic points made in that workshop and the current status of the resulting resource are summarized below. An integrated information resource on the introduction of organisms into the environment should be established. IRRO was established soon after the workshop. 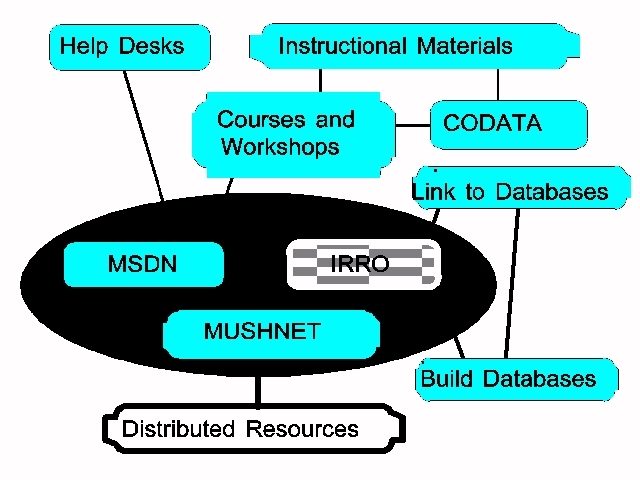 MSDN provides administrative support to the IRRO Steering Committee which oversees IRRO operations and makes policy. The resource should be international in scope and accessibility. The IRRO is accessible on the World Wide Web. Information on both non-modified and genetically modified organisms shoorganisms should be included. As indicated previously, the information utilized in the context of biosafety is from a variety of disciplines. Inclusion of information from these disparate disciplines inherently meets this requirement. The resource should include information on macrobiota as well as microorganisms. Many information sources consider specific kinds of organisms. However, the aggregate of these sources implement this recommendation. The resource should be not-for profit. To date, all the information available through IRRO is on the World Wide Web and available at no charge. Data should be made freely available as far as possible; confidential commercial information would be the major exclusion. Freely available should be taken to mean open distribution without restriction not, free of cost. However, there are no plans to impose fees. The resource should be a distribue should be a distributed network linking existing resources. IRRO links to a number of resources. At present, the IRRO home page is solely located on the server at the Tropical Data Base, Campinas, Brazil. Mirror sites can be established as desired. The distributed network recommendation is fulfilled by linking to various sites around the world. New databases should be developed only to fill gaps in information, avoiding duplication. Given the proliferation of information on the World Wide Web, one of the few databases that the IRRO should uniquely develop would be an evaluated listing of useful resources. The common search engines for the WWW do not evaluate. The separate information resources should be linked. Such linkage is usual in the construct of the WWW and is the practice in the IRRO information set. However, these linkages are not automatic if E-mail searching is used. Usage should be facilitated by te facilitated by the development of common interfaces. While this is clearly desirable, it is not practical for distributed systems at this time. Some commonality is imposed by the nature of the WWW. However, the problem of common interfaces (also termed interoperability) is the subject of much current research in informatics. The resource should be flexible, to accommodate different information sources already in operation (that may have existing distribution policies) and adjust to new circumstances that may arise. This recommendation recognizes the fact that existing information sources are reluctant to change policies and procedures to accommodate the needs of external linkage systems such as IRRO. Hence, interoperability is inhibited even should common interface standards be developed. Regional help desks and training should be important parts of the resource. IRRO has conducted workshops on biosafety around the world (e.g., Southld (e.g., South Africa, India). From these workshops we conclude that, in addition to more workshops, we need to develop training materials that can be used by themselves. Further, we need "help desks" to allow for follow up for participants in the workshops, persons doing self study as these materials become available, and IRRO users who have no previous training. Meeting these needs may well be the most important function and utility of IRRO. The Workshop participants considered the scope of the IRRO. They felt that the IRRO should work to encompass at least three broad categories of information: general information on organisms of potential interest to those concerned with releases, releases as such, and administrative and legal issues. A. Vocabulary. Communication requires common language. B. Functions and uses of s and uses of organisms. C. Systematics (and Nomenclature of Organisms). E. Characteristics of organisms (strains, cell lines, cultivars). 1. Organisms used in releases. 2. Organisms related to released organisms. 3. Sources of, or data describing, organisms. d. Zoos, aquaria, and animal preserves. F. Criteria for selection of organisms. G. Methods of genetic modification or selection. H. Methods of preparation of organisms. I. Descriptions of release sites. 5. Termination procedures for field trials. K. Monitoring data resulting from releases. L. Evaluations of previous releases. N. Guidance documents and conferences. P. Organizations concerned with release. Q. Exclude data which has been declared confidential. The participants felt that the community of potential users of the IRRO would be broadly inclusive. No single organization exists to provide the informational support that is needed to support biosafety reasoning, regulation, and research. Rather, a distributed system of resources exists and must be enhanced for full functioning. This point becomes clear as we consider the mutual reinforcement of the efforts of four collaborating organizations (IRRO, MSDN, CODATA, and MUSHNET) and all those persons who participate in the activities of each. The initiative for the IRRO grew fe for the IRRO grew from a letter from Dr. Hamdallah Zedan to the Executive Director of the MSDN. Dr. Zedan inquired as to the availability of an information resource for the area of biosafety. The answer at the time was no. Hence, UNEP funded the design workshop alluded to above. The workshop led to the formation of an IRRO Steering Committee to set policy and oversee the operations of the IRRO. The MSDN provides the daily operations and Secretariat functions. In turn, the MSDN was established by the Committee on Data for Science and Technology (CODATA) as an initiative of UNEP, the U.S. National Science Foundation, and the Commission of the European Community (DG-XII). The MSDN became formally independent of CODATA while maintaining liaison through common members on its Committee of Management and various CODATA activities. The MSDN builds and maintains databases, in collaboration with microbial culture collections, on the laboratory capacities of the collections. In addition, the MSDN has de MSDN has developed training course material and organized courses on microbial strain data collection, management, and analysis as well as methodology for online communication through electronic networks. These courses have been taught in many places in the world with emphasis on developing nations. As applicable, some of this course material also serves in the IRRO courses. MSDN has established a microbial informatics "help desk" in Nairobi at the National Museums of Kenya. This help desk serves as a triage facility for bidirectional international and local inquiries. More such help desks are planned. Based on the MSDN experiences, CODATA established a Task Group on Outreach, Education and Communication at the CODATA General Assembly in October, 1996. The Task Group will develop training materials in collaboration with the MSDN and mount courses in disciplines in addition to microbiology. The emphasis again will be training for, and in, developing nations. The MSDN established an internation international Network on mushroom cultivation, biology, biotechnology, and marketing (MUSHNET). UNIDO provided initial funding. The first group of collaborating network nodes exist or have been agreed upon in the USA, UK, India, Philippines, Russia, Peoples Republic of China, Japan, Vietnam, and Thailand. MUSHNET functions primarily by 1) linking databases together through a World Wide Web facility, or 2) providing contact information for databases that are relevant but are unavailable for direct linkage (e.g., are proprietary to commercial providers). The main linking database contains evaluated descriptions of the contents of the databases (whether directly linked or not) related to the content purview of MUSHNET. Providing for the future informational needs in biosafety requires techniques and resources which should draw upon the experiences and talents each of the four organizations. Each has multiple contributions to make to the whole. IRRO supplies subject matter expertise by virtue oby virtue of the composition of the Steering Committee and the links already established. The members of the Steering Committee are largely drawn from persons well known in the area of biosafety. Further, they provide a core of persons as faculty in the IRRO faculty. The database building and training techniques utilized by MSDN now and will continue to play a fundamental role in gathering and disseminating biosafety information just as they do for microbial strain information. As noted above, MSDN provides administrative support to both IRRO and MUSHNET. CODATA provides a critically important link to experts in many scientific and technical disciplines. Such linkage enables efficient and effective interdisciplinary communication in diverse areas as diverse as the fundamental constants of physics, soil science, oceanography, climate change, macromolecular databases, standardized nomenclature and terminology in biology, etc. As a Committee within the structure of the International Council of Scuncil of Scientific Unions (ICSU), CODATA provides further links to the various ICSU scientific Unions and other committees.